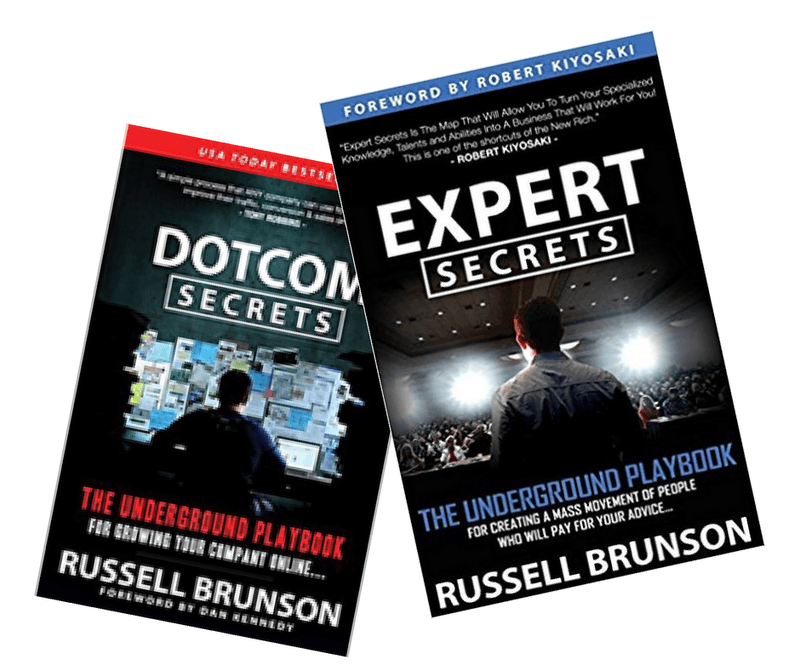 Russell Brunson's newest book 30Days just hit the virtual book shelves! Before you grab it here read the entire review to get over $2000 in extra bonuses. 30Days.com • What Would 30 Super Successful Millionaire Entrepreneurs do if they lost it all and had to start over fresh and build a successful business in just 30 days? I kinda missed the boat on blogging about this last week, however the video series contains insane amount of value and I know it can help you no matter where you are in your entrepreneurial journey! If you aren't familiar with Russell Brunson - despite the slight resemblance, no he isn't related to Matt Damon - he's the CEO of Clickfunnels, the leading platform for landing page and sales funnel design (similar to LeadPages, Kyvio, Builderall, OptimizePress, etc.) Russell got his big break online by selling plans for building potato guns while he was still in college and has created a digital empire from there. He's written two other books that I highly recommend- DotCom Secrets and Expert Secrets - and in those books, he uses his own success story and expertise to create the content of the books. However, he decides to take a different tactic for his latest book, and he focuses on stories from Clickfunnels' most successful members - 30 of the people who have made at least one million dollars with a funnel on the platform (also known as members of the Two-Comma Club). 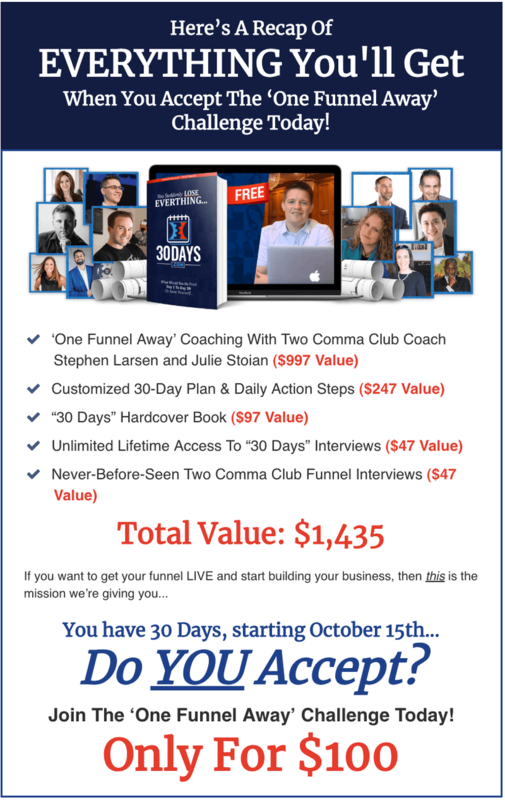 While some people, like the experts featured in Russell's new book, have built fortunes on the Clickfunnels platform, Russell has also seen many people get overwhelmed, confused, and defeated, eventually giving up on their funnel and maybe even their business. These are the people he's hoping to help with the 30Days.com book and video series. What would these millionaires do if they lost everything (their list, their partners, their money) and had to start over again? What would they do in 30 days to save themselves and build back their business, finances, and reputation? Is Russell's new 30Days content legit? Or is it a scam? Is this just another income stream for him to add to his portfolio? Currently, if you head over to 30Days.com, you're met with a video that's not intended to be funny but has the most ridiculous facial expressions you've ever seen - definitely worth a watch! There might be some confusion, because when you register, you'll see this pop-up for a free summit. Initially, Russell played ten videos a day for three days for free, but that ended on September 19th, so the summit, unfortunately, is over now. Long story short, 30Days.com, IT'S WORTH IT. 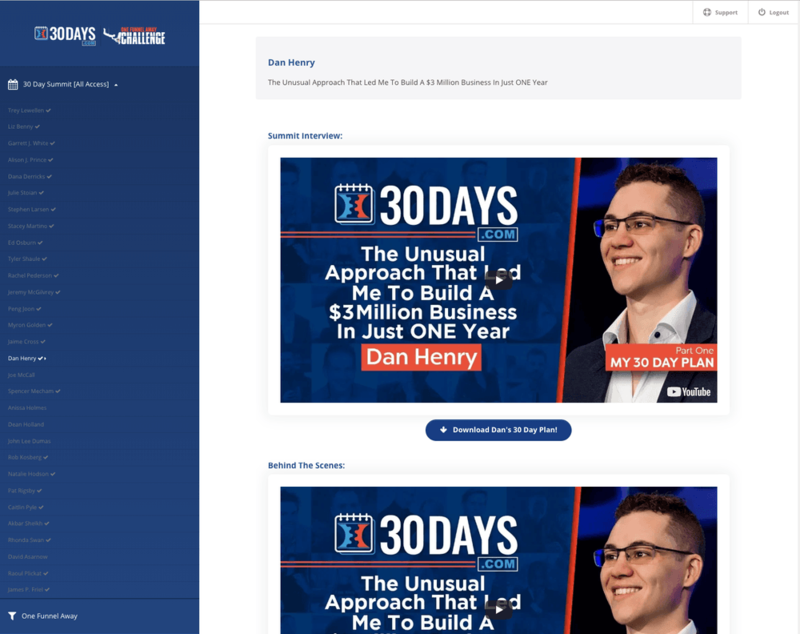 By joining the challenge, you get access to the 30Days video interviews so you can go through them at your own pace, as well as both hardcopy and PDF versions of the 30Days book, and behind-the-scenes video walkthroughs of each expert's million-dollar funnel. If you're struggling to grow your online business, if you've poured money into masterminds and courses but still haven't figured out the actual formula for achieving success as a digital entrepreneur, then you need to join this challenge and get the 30Days content. These are 30 blueprints for success, broken down day by day, so you know exactly what steps to take every day for one month to turn a profit and finally break free. What's The Verdict About 30Days? Is the setup a little sketchy? Yes. Russell shouldn't be luring people to opt in for a free summit that's already over. That's shoddy marketing. 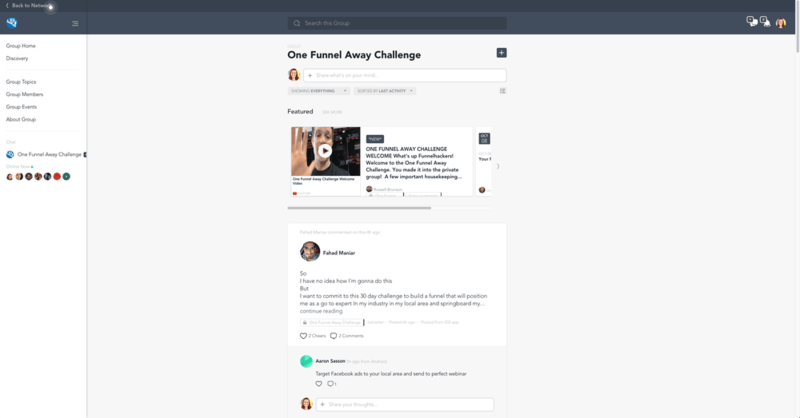 But is the content in the One Funnel Away Challenge legit and more than worth $100? Absolutely. You get concrete, actionable plans that you can execute every day for the next month and completely turn around your financial situation and online success. 3️⃣ Get 50% off when you have us build your new opt-in funnel or sales funnel (up to $500 savings!). Once you have your perfect funnel strategy, let us handle making your killer funnel while you focus on the essential parts of your business - content, and sales. 5️⃣ SUPER EXTRA BONUS: For the first ten people who sign up, you'll get ONE HOUR of one-on-one coaching to answer your questions, go over your funnel or strategy, build a funnel together, WHATEVER YOU NEED TO SUCCEED with this program ($195 value). 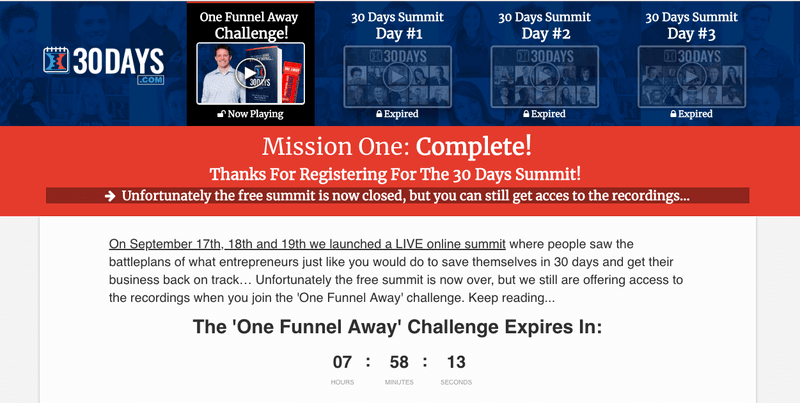 These bonuses will save you hours of wasted time and prevent ugly funnels! Plus, you'll get true personalized support and coaching! 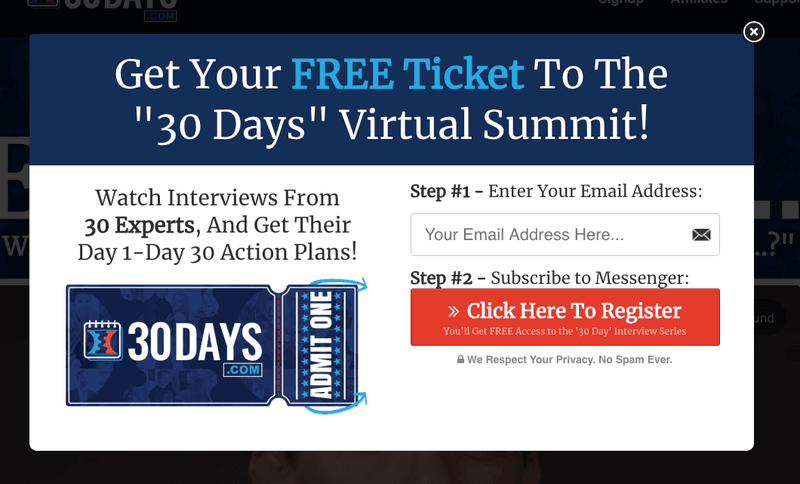 30Days.com is the new online summit and challenge from Clickfunnels and Russell Brunson, where you can get surefire blueprints for success from 30 digital entrepreneurs who have each made at least seven figures with their sales funnels. You'll get 30 step-by-step plans that tell you what these experts would do if they had to start all over again... from day 1 to day 30; this is how they'd build a business and save themselves from mounting bills. If I had to start over again, I would start with this book. This is a great start for anyone who wants to build a successful 6-figure online business as a coach, consultant, course creator, digital marketer, live event trainer, ecommerce store owner, freelancer, or service provider. IF YOU'VE BEEN WISHING FOR A FORMULA FOR SUCCESS ONLINE, THIS IS IT. Our blog posts are focused on helping you become your best self and helping you excel as a polymath. We'll share book reviews, marketing strategies, tech news, biohacking tips, and our hottest finds for tools and services that will allow you to automate and growth hack your way to success.